Coursework is a specific amount of work that you undertake during an educational course. It is a form of an essay under a title that your tutor will provide. Coursework requires detailed research to come up with academically acceptable facts supported by specific evidence. It is an essential academic assignment, and even a slight mistake can affect the grades. Academic Writers Bureau has the commitment to enable students to hand in the best coursework through highly efficient Academic coursework editing help to amend all the errors on their papers and improving the overall presentation. AWB has in place a team of editors with particular skills and experience in editing coursework. We hire editors with proven ability to understand the essence of a topic and coordinate the editing to make the necessary amendments without changing the main idea by the writer or tutor. Your demand is our concern. We edit work to meet full requirements by clients till they are satisfied. In case some of your instructions affect the editing, we inform you on time, explain the challenge and offer suggestions on how to resolve the matter. Different lecturers have different requirements for coursework papers. Students with many other assignments find it hard to coordinate writing various papers and may miss some instructions. Academicwritersbureau.com does not just edit the text. We check all the directions on issues such as formatting, work count, referencing and so on to ensure that we observe each and rewrite any section that is not following the guidelines. No instruction or topic that can overwhelm as our editors are specialists in different scholarly areas. Coursework editors are qualified personnel with either a Masters or Ph.D. degree. They are experts in their academic disciplines and will handle any topic falling under their specialty. All editors are a dedicated lot that solves the challenges in writing and makes sure they improve coursework to an error and plagiarism proof paper. Your editor will enhance punctuation, grammar, structure, language, and coherence. At the end of our academic coursework editing services, your work will have an appealing introduction, detailed body content and a powerful conclusion all in a proper structure and language that increases readability. Academic Writers Bureau does not assign an order to any editor. We only send your work to a specialist in the subject of your coursework who in the paper wrote such an assignment hence knows what your lecturer will look for in the paper. You will have access to your editor for you to follow up the editing process and give suggestions. To ensure that your work reaches our strict editing guidelines, our chief editor checks all sections of your coursework before we send it to you. Looking For the Best Academic Coursework Editor Online? 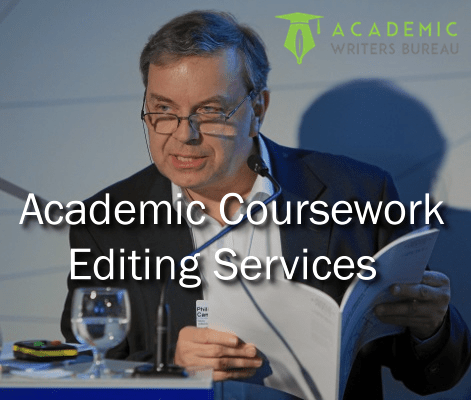 Have your coursework edited by an experienced specialist in your course, let academicwritersbureau.com help you please your lecturer. What is my guarantee to a good editing? We have been offering academic coursework editing help for years and have a track record of satisfying our clients. Please refer to our samples and testimonials. Do you have editors for all coursework subjects? AWB has a large pool of experienced specialists in a different field. We find an expert in your area. How Do I pay to place an order? We accept payment by the most convenient method for students, PayPal and credit cards. How do you calculate editing rates? We use word counts, type of work and turnaround to calculate the cost. We do not have other hidden costs. We have professional editors with enough skills to meet your requirements, but in case we do not satisfy you, a free revision is our solution. I thank my editor and support staff of Academicwriterbureau.com for excellent coordination and editing within a short time. The editor removed all errors from my coursework, and I still got my paper hours before my deadline. I recommend AWB for their sound editing and explanation as well suggestions on the changes made by the editor. They will help to improve my writing skills.